Our Open Enrollment in San Francisco is up and running. They are the Golden Gate PHOENIX! And that’s an acronym that stands for Powerful, Hopeful, Optimistic, Effective, Nurturing, Inclusive eXperience! And program activity is happening in South Africa, New Jersey for Haiti, Turkey for Afghanistan, Uganda, and in Oklahoma City too. We will be holding a fundraising event in partnership with LifeLine Johannesburg on Thursday evening the 15th of November 2018. Come and join us. Learn about ACEs and reasons to be hopeful about a better future. If you are in South Africa and you are interested in joining the team, come to our New Facilitators Meeting on November the 7th. Take a look at the calendar and contact us for the details. We are offering another program to residents of the San Francisco Bay Area. Space is still available. If you are interested in participating in the program, please feel free to contact us about the information meeting. The next one will be at ArtSeed at the Presidio on Tuesday evening the 31st of July from 5:30 to 7:30. The Winner of Our Raffle to Win a Sail on San Francisco Bay! For $10 you can win a sail on beautiful San Francisco Bay. For $80 you get 10 chances to win. Contact us by phone or email and get your raffle tickets. You can also purchase raffle tickets at the Think Round Gallery on Bush Street, the Western Institute for Social Research in Berkeley, or the Artseed offices in the Presidio. The raffle will end on Thursday May the 31st just before the drawing at 6:30pm that evening. Drawing will be held at Suite 206, 1007 General Kennedy Avenue, San Francisco. You do not have to be present to win but you are welcome to come to the Presidio and attend the drawing, claim your prize, or celebrate the lucky winner. See Raffle Rules and Regulations in the link below. 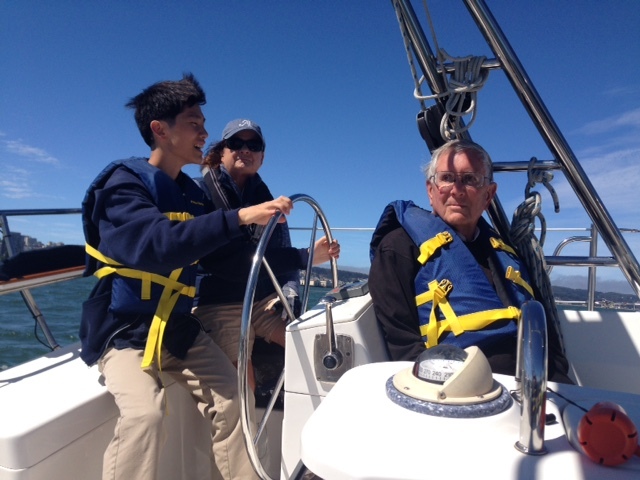 The lucky winner gets to bring as many as five friends and enjoy a four to six hour sail on the Bay with Captain Lisa Chapin of SailTime San Francisco. And so, the drawing was held and the lucky winner was Josefa Vaughan. Congratulations Josefa! She brought some friends and family along to enjoy the day with her. Thank you to Captain Lisa for your generous support! We are currently running a crowdfunding campaign for South Africa on Start Some Good. Please go and check it out and be impressed with that video we put together. Click on this link. If you feel inclined to donate, we'll be so grateful! Any amount will be appreciated. Truly! We do the dance of joy for every donation that comes our way. If you cannot afford to donate, we'll be happy with some praise for that great campaign we put together. Our first attempt at such things! The campaign ends on April the 21st. Those nine beautiful young people at the start of the video on Start Some Good are students at Seshegong Secondary School in Olievenhoutbosch, Centurion.